Obviously, I’m not talking about my waistline, but about my overflowing stash of fabric. I’ve been trying to get serious about simplifying and slimming down around here–which meant me taking a very close look at what fabric is staying in the house. 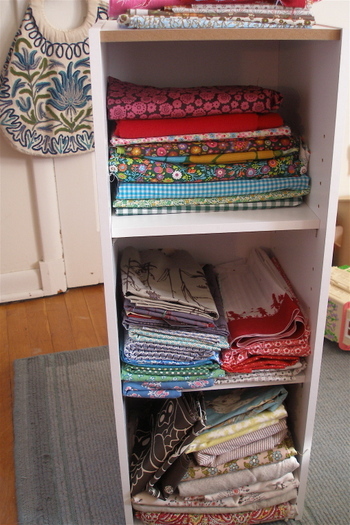 This tiny little shelf holds some favorites and some of the most versatile fabrics that I have. The rest has been relegated to storage. I try to tell myself that it will be like Christmas on that day when I have the space to have it all out and at my fingertips again. But for now, priorities. Simplify. Simplify. Simplify. I had every intention of posting this morning, as I realized the week had slipped by with only one other post. But I was in such an overwhelmed, end-of-my-rope state of mind, that I knew the post would be just a big blubbering mess. I’m trying to remind myself that I’m nearing the end of the long road of pregnancy, but when you’re in the midst of the exhaustion and emotion, it’s hard to remember how you were when you were "normal". You start to believe that THIS is your normal. So, I took a step back by getting out some lacing cards, which she breezed through. And I’m thinking Vicki’s suggestion to Blair of marking where stitches should go, will really help when we make the transition to fabric. 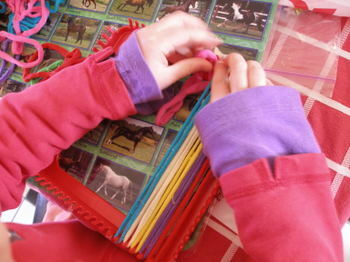 Right now, she’s working on the good old potholder loom. I love that thing and used to make them a lot when I was little, although I never knew how to finish them. And selfishly, I’m hoping this one of the rack right now will be for me. You just can’t beat the loom potholder. I figured she’d only be good for the first row of looping, but now I hear her over there: "oooover….unnnnder….ovverrrrrr….unnderrrr." I haven’t looked at her work recently, but she’s sticking to it and that’s important. Hope you all have a wonderful weekend. I’ve got a stack of vegetable gardening books on my bedside that I’m anxious to get into. We’re supposed to have a weekend warm-up although I’m not feeling it yet. I’m starting to get excited for Spring, which means that my deadline for this is approaching. There is still much to do, but I enjoy it, and I’m getting there. I’ve been sewing with Amber last week and she isn’t very patient either. But I’m happy that she shows any interest at all! I must ask, did you make that beautiful bag in the background of the first photo?! Oh, I used to love making those potholders at my grammy’s house. I know the end of pregnancy is no fun — I hope you can get what rest you can. we have two of those potholder looms – the best! so much fun. oh look at those busy hands! love em.have a restful weekend! We haven’t tried the loom yet, I loved it so much when I was young. I love those potholder thing-ys too! I totally forgot about them, I remember when Emma was little thinking how great it would be when she could finally use them. I have to say, penciling on the dots really helped the girls, and they absolutely cannot be seen on the finished product. Your Emma will do so great, please show us what the final product looks like. My son is in the middle of making one of those potholders, too. “In the middle” may be a long part of the process, though. You sound so at peace and joyful in your post…decluttering must become you! I love those loom potholders as well.